Saturday today and another Fashion Trend post is up. This time we are going to have flowers in our outfit. As usual three different outfits for different occasions. Floral prints are always classic in the world of fashion and has been loved by many designers. A fashion trend that will never get old, perfect for every season and time of the day or night, if you wear it correctly. It is true that there are plenty floral prints and it is really difficult to choose what to wear. It is important to choose a pattern that works with your personal taste and style. Flower designs can range from dainty and delicate to big and bold, each kind carrying its own personality and character. If you prefer a romantic or simple or sophisticated style, try looking for a print that features small cute flowers. Use pastel accessories and create a petite girly outfit. If you’re the type to rock statement patterns, a print featuring larger flowers will work best for you. Look for bright colors, vibrant designs and eye-catching details. 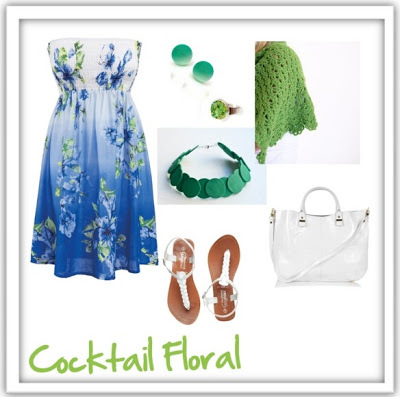 Once you chosen the floral print, try to wear it with other clothes in a way that will create a cohesive look. For example, pay attention to pattern’s colors, choose one or two, then use monochrome accessories or shoes and the bag of course. If you do not want to have a completely floral outfit, use floral accessories or coats or just a shirt and then combine them with the proper accessories. Because floral prints typically come in multiple colors, you’ll have multiple styling possibilities. By saying neutral colors we mean black, white, ivory, grey and beige. Ad as with any other print, it is practically impossible for a floral print to not look good with a solid neutral shade. Using neutrals is another styling option to use when you aren’t wearing colors found in the actual print. It’s also a good “safety” styling method when you aren’t quite sure what to wear, but would like to add floral to your ensemble. Imagine what a plus will be to wear a floral scarf or having a floral bag with a monochrome black or white appearance. This outfit will be just perfect for every occasion, for the office, for a friendly lunch, for having a drink with your friends or boyfriend. Accessories are must for every outfit. Just imagine how many different outfits and styles you can create with the same clothes and different accessories in colors or styles or materials. Even just one accessory is enough to brighten up an otherwise plain outfit. Chain jewelry or accessories in neon or pastel colors can be combined with floral dresses or shirts and will definitely create something unique. For example for a petit romantic outfit, just use pastel jewelry or petit, elegant chain jewels in gold or silver tones. Larger items such as bags, hats and scarves can add some major color to a look, while jewelry and belts can bring in a light dose of floral fun. It’s always a good idea to have several flower patterned accessories in your wardrobe and use them with monochrome clothes or with the right stripes or even with jeans. Even if you don’t plan ahead, a floral accessory is an easy way to add instant style, especially for your office appearance. 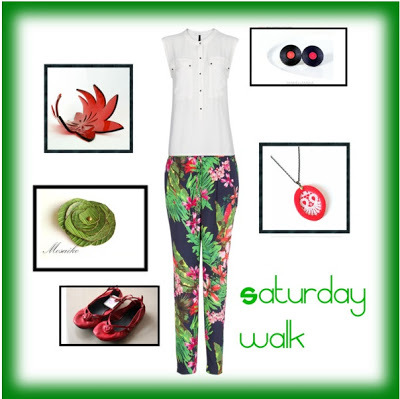 Blazers, straight leg pants and crisp button can look awesome wearing them with floral details. This will prevent your outfit from looking too monochrome and monotonous, and instead create a classy, mature look. You can use this method for office looks, taking care to balance the ratio of neutrals and bright colors. 4. Pastel or Bright colors? Both… depends of the occasion, from your style and from your mode! Pastel accessories or crochet shawl and with beautiful sandals or ballerina shoes, will give to your floral outfit a tone of romance! Bright colors or even neon colors will transform your appearance and you will definitely be the center of the party. Use your imagination and create a beautiful outfit perfect for yourself! Thank you so much for featuring my bracelet. It´s a wonderfull post to read, and your combinations are amazing. I admire these posts of yours soooo much! I am almost illiterate when it comes to combining clothes, you should see what I wear to go to work, lol!!! Thanks for sharing this helpful info and for including my earrings! Love your post Zina! Your suggestions are amazing! Thank you for featuring my shawl! Thank you for including my green leather brooch! I think that I would reconsider my opinion on florals!!!! Oh my goodness! I love the floral by night collection. That dress is stunning, and those shoes . . . LOVE!